More is always better, right? Don’t be so sure. When it comes to your marketing strategy, hiring two marketing firms is unlikely to give you twice the results in traffic and leads. In fact, hiring two marketing firms is much more likely to hurt your business in the long run and waste your money. Why? It’s a classic case of too many cooks in the kitchen. Valuable marketing time is spent coordinating with another company. When you start working with multiple marketing firms, you’re essentially paying for the extra time it takes for multiple companies to coordinate with each other instead of working on your marketing efforts. With so many fingers in the pie, miscommunication also becomes a bigger risk. Work is constantly being redone or overwritten. A really common issue with using multiple marketing firms is that they’ll end up just overwriting each other’s work. Even with excellent communication and coordination, a lot of work ends up getting done twice or unknowingly undone when you have multiple SEO teams, social media experts, and content writers climbing over each other to tweak your campaigns. No one is really in charge. When you don’t have a clear leader, it creates confusion. Because neither marketing firm is really able to make final decisions, it can create a situation where neither firm really meets its full potential for you and your business. It’s harder to track what is and isn’t working. Great online marketing takes some time to develop, but that can slow to a halt if there are two sets of hands making changes and modifying approaches. With no one person at the helm, all those tiny back-and-forth steering adjustments can lead you wildly off course. And, with two sets of hands handling your analytics and tracking, it’s hard to really see all the signals and symptoms of the drift until it’s too late. Tools and accounts don’t always match up. Most marketing firms have a few special tools in their toolboxes, and they rely on a number of outside services and accounts to handle your marketing work. 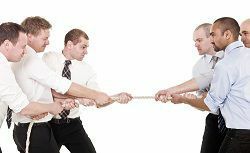 If you’re using multiple marketing firms, there can be conflicts with differing content management systems, webmaster accounts, social media accounts, and pay-per-click campaigns. This makes it almost impossible to take steps that are really unified toward your goals. For example, if one company is disavowing links through a different webmaster’s account than the other firm, they are basically doing that process twice, which makes it hard to know what is actually being done and what is working. You’re paying more for less. In a nutshell, hiring multiple marketing firms to handle the needs of one business really just adds up to additional costs with potentially less effective results—and that just doesn’t make good business sense. If you want to succeed with your marketing, you—and your marketing firm—need to be able to put a laser focus on your goals instead of getting lost in the mud. Give us a call today at 888-886-0939 to talk about how we can help you get the kinds of results you’re looking for.